Last Sunday I had the pleasure of enjoying lunch in La Jolla with four lovely and talented food bloggers: Kalyn of Kalyn's Kitchen (center), Amanda of What We're Eating (back right), Nicole of Pinch My Salt (front left) and Alice of alice q. foodie (front right). You can check out the wonderful food we ate over at Kalyn's Kitchen. (Thanks, Kalyn, for sending me this picture). Among the different topics of conversation, places to live came up. When Kalyn mentioned that she had a beautiful garden in Utah, there was a collective "Awwwww " and many variations of "I wish I had a garden." Then Kalyn added, "Yeah, but don't forget that when I'm freezing in the winter in Utah, you're enjoying beautiful weather here." When I mentioned that I live downtown, Nicole said, "I'd love to live downtown." Though when she announced she was starting a garden in her new house, I lamented that I can't even keep basil alive on my condo deck. Life really is relative, isn't it? We all agreed, however, that having a fruit tree in your yard would rock. In fact, our lease is up soon, and Jeff and I are looking around to buy. He's leaning towards a condo, but I keep sending him emails for houses with lines like: "Lovely mature avocado tree in the backyard." Lots of people in San Diego have avocado trees. In fact 95% of avocados produced in the US come from Southern California with a whopping 60% from San Diego county. Thankfully we have friends like Terri who have avocado trees and generously share their bounty with us. We've enjoyed Terri's fresh, delicious avocados in everything from breakfast egg sandwiches to salsas. Hass avocados (pictured above) are the most widely consumed avocado in the US and are available year round. It's easy to tell when these oval shaped fruits are ripe: their deep green pebbled skin turns almost black. The pale green flesh of the Hass avocado is creamy and custard-like and has a rich, slightly nutty flavor. Fuertes avocados, another popular California variety, also have a smooth, pale green flesh but have a fruitier flavor. Since Fuertes avocados have a lower fat content than the Hass variety, the flesh tends to be less creamy. Unlike the Hass, its green skin is smooth and retains its color even when fully ripe, so check for ripeness by gently squeezing it: it should yield slightly. Avocados get a bad rap for being "fattening." That's not completely true. They are high in monosaturated fat or "good" fat which can lower your "bad" (LDL) cholesterol. Still, it's wise to eat them in moderation since they're dense in calories: one-fifth of a medium avocado, or about 2-3 thin slices, has 50 calories and nearly 20 vitamins, minerals, and phytonutrients (which are believed to reduce the risk of stroke, heart disease, and cancer). Firm avocados can take up to 1 week to ripen. To quicken the ripening process, place the avocado in a paper bag with a yellow banana. The banana releases ethylene which speeds up the ripening process. Store avocados on the counter until ripe, then refrigerate until ready to use. 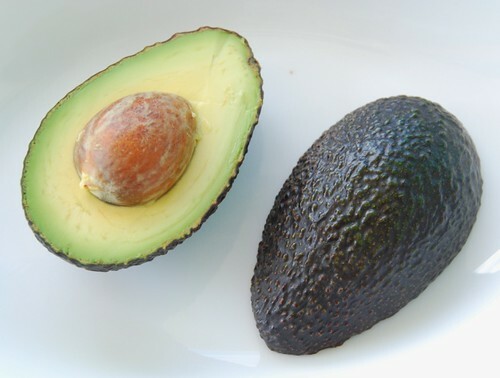 The flesh of an avocado oxidizes, or turns brown, quickly. To prevent discoloration, sprinkle the cut flesh with lime or lemon juice. Also don't cut the avocado until you're ready to use it. 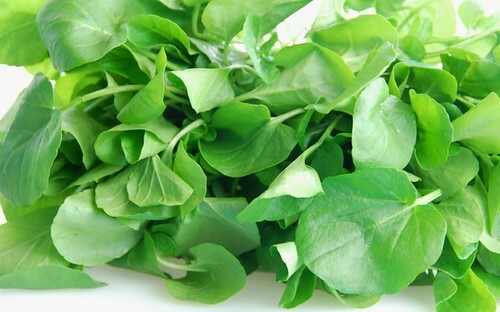 Watercress (pictured above) is a bright green leafy vegetable with an intense peppery flavor. In this salad, its sharp edge is balanced with the cool creaminess of the avocado and the sweet tang of the orange. I'm sending my sassy salad to Michele of Greedy Gourmet for her Snack Shots #4: Salads. Plus I'm tickled to announce that my post Muffin Tops: Flat or Pointy? was the winner of the Word4Word Contest in Snack Shots #3 Muffins. Many thanks to Jeanne and Rita who judged. To make the dressing, whisk all ingredients in a small bowl until well blended; set aside. For the salad, slice the avocado and sprinkle with lime juice to prevent it from oxidizing, or turning brown. 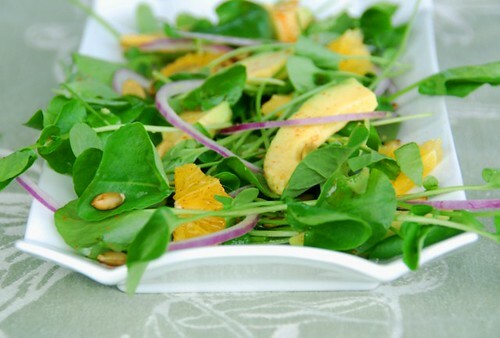 On individual plates, add watercress, then top with orange, avocado, and onion slices. Drizzle with dressing, and sprinkle with pepitas. It really is relative isn't it? (Although I definitely vote for a house, especially if it has avocado trees!) It was so fun meeting everyone. Thanks again for the ride, and I hope we can have another lunch or dinner sometime! So much fun - what a great idea you all had to meet up... but an even greater idea... an avocado tree. Wow - what I wouldn't do for one of those. I don't know how it'd do here in the Mid-Atlantic but that sure is tempting. Actually, 250 calories for a whole avocado doesn't seem so bad. Especially since it's still way lower than a slice of cream cake. The problem with me is I usually flood it with condensed milk-- that certainly can't be good for anyone! (Well, not good for the body, but it is good for the soul, haha!) Beautiful salad! Very Californian! How fun meeting fellow bloggers, its amazing how many friends we all have in this wonderful community! 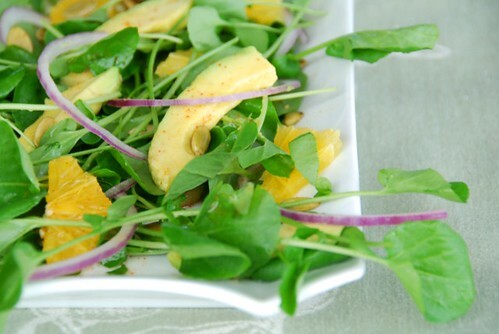 Great salad with that buttery avocado! That salad looks delicious! Avocado can't be beat! It's only in the last few years that I've truly "discovered" avacados. They are wonderful, aren't they? I say, go for the house! Love the buttery texture of it. I know I probably don't get to vote... but buy the house with a garden. After a lifetime of living in cities, I now live in a place where I can have a large herb garden (and veggies, too, though I haven't made that leap yet). And we inherited two pear trees on the property, which are the joy of every summer. Your salad is just beautiful... and how wonderful to have met so many excellent bloggers! "Life really is relative, isn't it?" How true!!!! Salad has the words 'frehsness' and 'yum' written all over it! What fun for you guys! That photo is just beaming with camaraderie. Don't let the lack of an avocado tree keep you from an attractive property, Susan. You can always plant your own. Green thumbs are not so scarce that you cannot cultivate one. Pretty salad. I agree that avocados get a bad rap. Oh I wish I live somewhere were we could grow avocados. And mangos! Then I'd be set. We do have a plum tree and blackberries and blueberries but it would be nice to grow something more "tropical". Susan, it really feels like we're in the same boat! My husband and I are constantly thinking about where we want to live (Ft. Lauderdale is ok, but it's not for us). Problem is we bought a condo about 3 years ago and won't sell it unless we can make a profit. I would love to have a garden (mine would have a fig tree), but we don't want to buy again right away, and we like living in a city. Such dilemmas! You gorgeous women you! Love seeing you all together. Aren't avocados simply beautiful? I think their internal color is just sublime. Not to mention flavor. Gorgeous salad. Very nice! Advantages and drawbacks go hand in hand. I am still reluctant to use avocados, not sure why. Maybe this will be the nudge that I need. How great you got to meet your fellow bloggers! What a great idea! Your salad looks wonderful. So summery and fresh. I love the dressing you used. How fabulous to get everyone together like that! I bet you all had a terrific time. What a fun lunch that must have been! The avocado salad looks amazing! One of my favorite summer dishes. I like to have a half for dinner drizzled with olive oil and sprinkled with salt and ground pepper. That salad looks devine! Thats so great that you guys got to get together for lunch. I must try to organize somthing like that for Seattle bloggers. There certainly are plenty of us. BTW- I love the necklace you're wearing!! I have some lemon and lime trees in our yard, as well as tomatoes in pots and herbs in our courtyard. Can't grow much more than that. Good luck house hunting... seems to be a good time to buy! Keeping it simple is the secret to great entertaining. Your menu was inspiring. WoW, love those green scene of the salad. I will increase the amount of avocado as I'm love the avocado's taste. Thanks for the great recipe here, really appreciated. 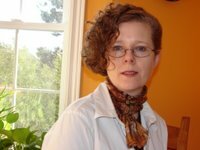 I had seen you at Kalyn's kitchen blog... how lovely that you could meet and talk and spend some time together... I would love to do that too! I'm an avocado lover! It's texture, and flavour and taste, mmmmmm I love it! Any tips for growing one in the garden out of the seed? Have you tried that? I have tried but haven't been lucky. I love living in a condo but yes, a house with an avocado tree (or any fruit tree) in the garden would be wonderful! My potted herbs are hanging on by a thread! You guys must have had so much fun! I agree, an avocado tree in your back yard would be the best. That salad looks delicious, such beautiful colors! I love a good avocado, fat and all. A burrito or taco just isn't the same without that creamy goodness. Aren't you girls lovely?? I'm sure you had loads of fun together! What a colorful, fresh, healthy, delicious salad, Susan. I wish I had a friend who grew avocados! The salad looks so fresh and summery! Thanks for the shout out! Lovely salad, avocado's are delicious! kalyn-Yup. :) I hope so too. Soon! kara- Yeah, I think they like the temperate climate here. But it is tempting, isn't it? marie-It is wonderful, isn't it? rosa-It was so much fun! happy cook-I love to fill the avocado cavity too. Shrimp would be lovely. lydia-Pear trees? How lovely, indeed. 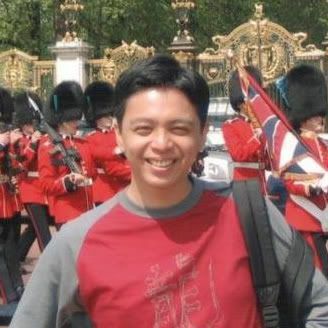 shn-Aww, many thanks, my friend. rachel-Mangoes would be fabulous. Of course, blueberries and blackberries are tops in my book! julie-Oh, yes a fig tree would be heavenly! I hear you, Julie. Seriously. simona-I really like them in salads and salsas. farida-Why, thank you so much! lori-Lemon and lime trees would make me happy too! pork chop recipe-I'm glad you like it. Enjoy! tenina-Ooh, Aussie food? Sounds like fun to me! nuria-No, I haven't tried it, sorry. linda-Looks like fruit trees would make many of us delighted! 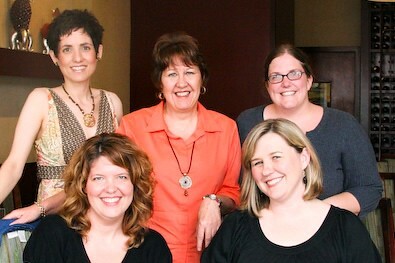 How fun to meet with other food bloggers! I am an avocado addict. I love them with almost anything- great on BLT and on eggs benedict (counteract the "bad" cholesterol)! Oh it looks like you had a blast, what fun!! I would LOVE an avocado tree! love the salad, love the idea of an avocado tree, and what a fun lunch! if i can find a manhattan apartment with any kind of fruit producing tree on the premises, that is definitely where my fiance and i are moving! My son Alex just told me he and his GF would love to have a lemon tree when they move to SoCal next year. I said- Wow- wouldn't that be amazing? Everything *is* relative- and sometimes it's tough to pick your priorities. Where I'm at right now? I'd love to live downtown and walk everywhere (coming from very rural isolation). I'm glad you had such a fabulous lunch with the other food bloggers, and I really hope to be able to join all of you out there very soon. That must have been such a fun lunch! I so enjoy meeting other bloggers, especially when they love food. I'm going to miss not being able to go to the BlogHer Conference this year. What a great time I had at the food blogger dinner. Just so lucky to all me. I'll love to do that someday. First of all, I am beyond jealous. 1) That you all got to meet up. I bet that was such a fun time! 2) That anyone would have an avocado tree in their backyard. Oh what I wouldn't do to be able to walk outside and pick a fresh avocado off a tree! And congrats on the Snackshots Word4Word win - very well deserved! Hmmm, I wonder if my emails fall into your spam trap, because I've emailed you twice with no response but you seem like quite an attentive to me. ;-) Received your salad entry, thanks. Did you receive the badge I sent you a few weeks ago? Also, would you like to be a judge this time round? deborah-My husband loves them on BLT's too. karina-They'll get their lemon tree, I'm sure! I hope you can join us soon too. anali-Oh, that's too bad. I remember your posts about it last year. helene-I hope you do soon. michelle-Thank you for leaving this comment. I just checked my spam box and saw your email. I just emailed you.